SALE SITE: At the Ranch located from Granite, OK, 3 miles North on Hwy. 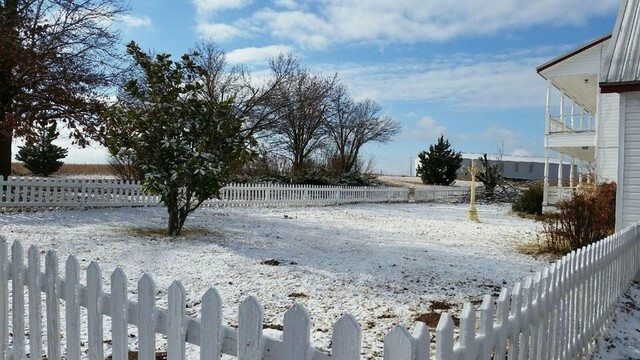 6, then 2 ½ miles East on CR #1380 (41374 E. CR. 1380 Rd.) Folow link provided in Directions tab. 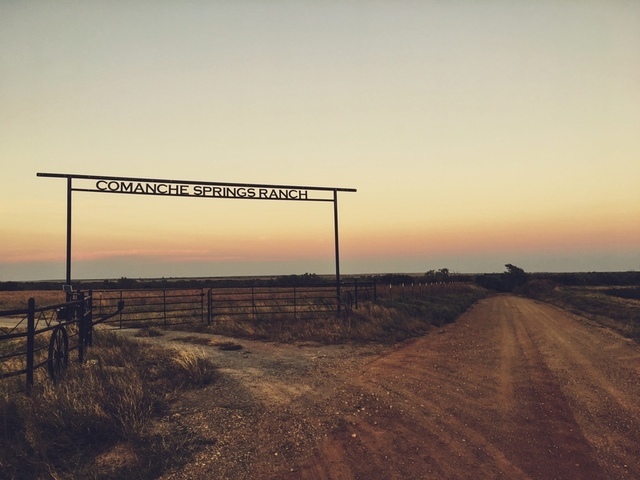 The Comanche Springs Ranch enjoys a rare and unique history. 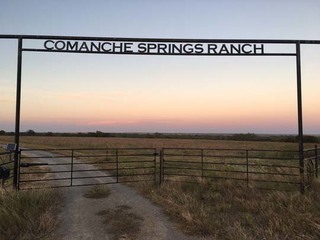 Originally part of the Briggs Ranch that was established in 1884, Comanche Springs can be traced back in written history to 1541 and expeditions of Spanish Explorers. Further, the area was noted as a watering point and stopover on the Great Western Cattle Trail during the mid-1800’s. The Comanche Springs Ranch is in its natural state today nestled along the banks of the North Fork of the Red River. 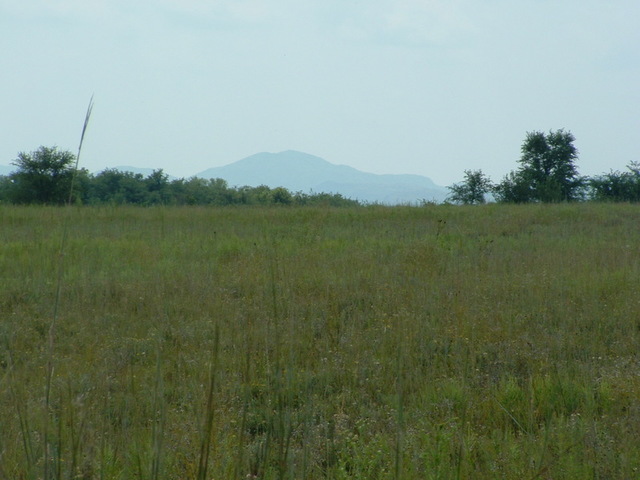 The land has never been farmed and is a rare example of undisturbed native prairie. 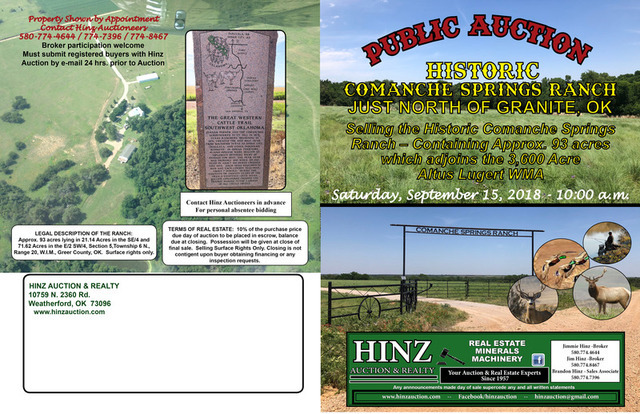 Being offered at Public Auction on September 15, this is a once in a lifetime opportunity to invest in some of Oklahoma’s history while enjoying modern amenities and some of the best hunting in the region. 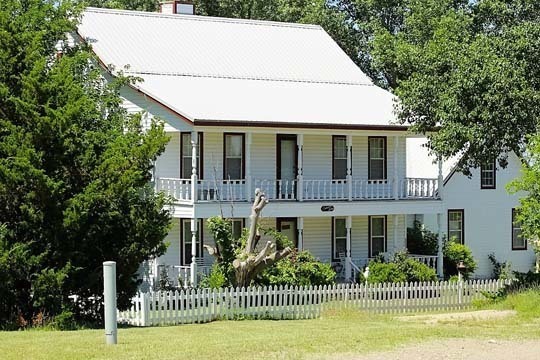 A main ranch house has 4 bedrooms, 3 ½ baths with over 3,500 square feet of living space. The home offers unmatched views on the expansive porches. You can enjoy the summer with the in-ground swimming pool and feast on meals prepared in the modern kitchen or outdoor grilling area. A bonus game room provides for extra indoor entertainment. The second home has 3 bedrooms, 2 full baths and over 2,000 square feet. This would be an excellent care-taker’s home or would make a nice guest house. 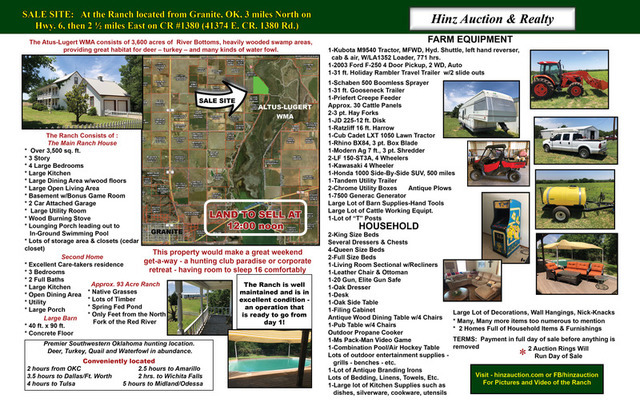 A large 40’ x 90’ metal barn with cement floor is a perfect place to house your tractors, 4 wheelers, pickups, equipment and tools. 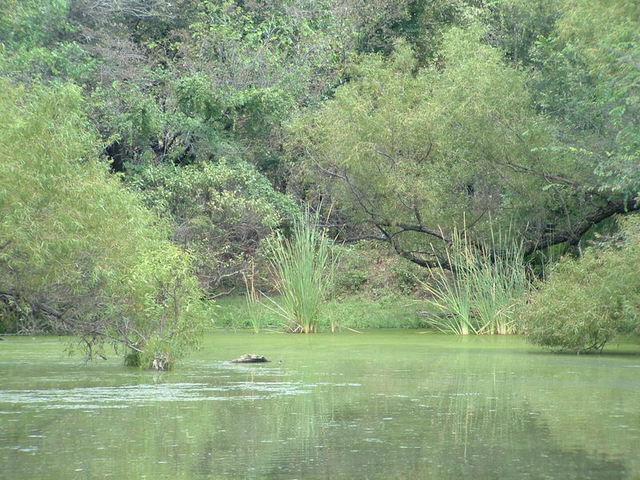 Comanche Springs Ranch has a stocked, spring fed pond. Catfish, crappie, small and large mouth bass are plentiful. 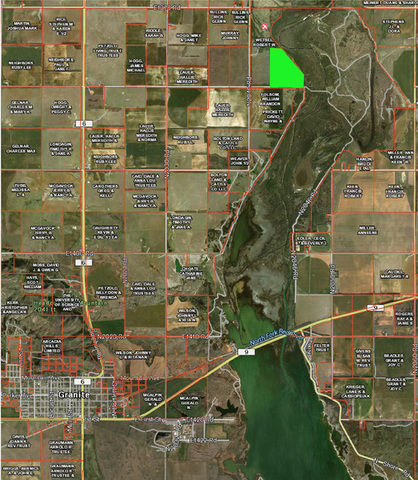 The property adjoins the 3,600 ac. 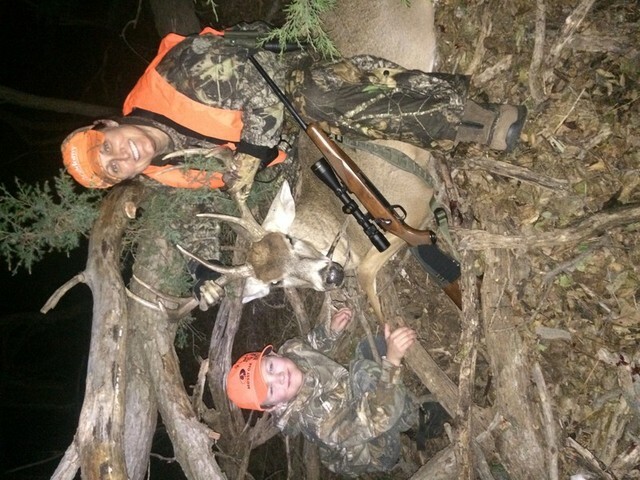 Altus-Lugert Wildlife Management Area along the Greer and Kiowa county line. The North Fork of the Red River flows through the area which teems with wildlife. 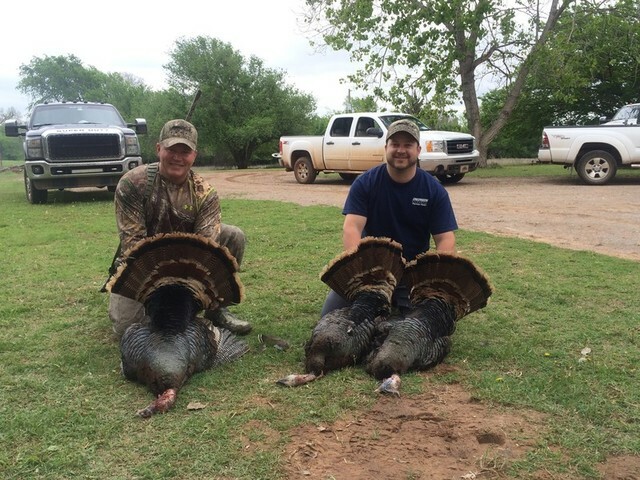 Deer, turkey, quail, dove, bobcats, racoons, waterfowl and other game species are abundant. Quartz Mountain Resort, Arts & Conference Center on scenic Lake Altus-Lugert is only about 9 miles to the south offering an 18-hole golf course and various water sport activities. 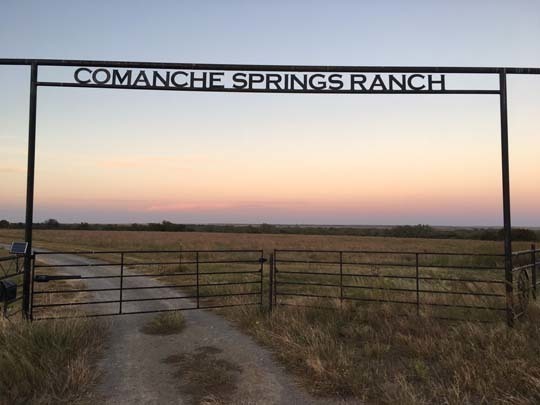 Comanche Springs Ranch is centrally located – being convenient driving distances from Dallas/Ft. Worth, OKC, Tulsa, Amarillo and Midland/Odessa Area. 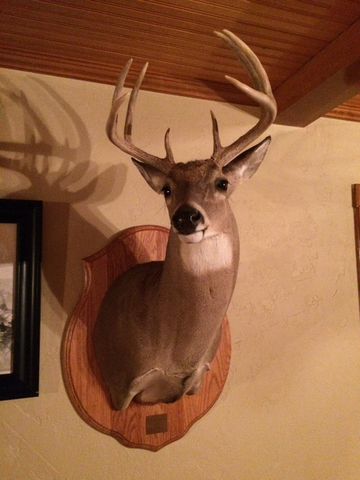 This is a unique, turn-key opportunity to establish a Hunting Club, Corporate Retreat or for a family to enjoy the wildlife, western lifestyle, and world class hunting. Come and plan on spending the day with us at the beautiful Comanche Springs Ranch. 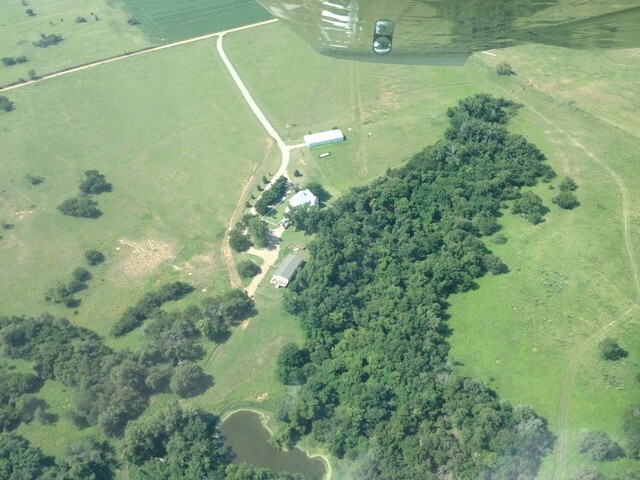 The Ranch is well maintained and is in excellent condition – an operation that is ready to go from day 1! 1-Kubota M9540 Tractor, MFWD, Hyd. Shuttle, left hand reverser, cab & air, W/LA1352 Loader, 771 hrs. 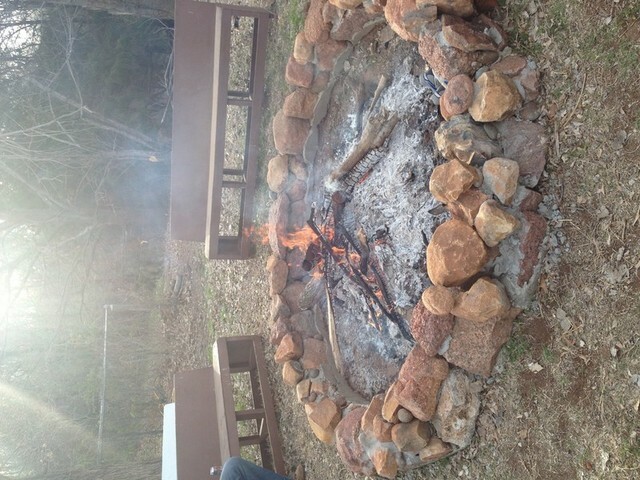 Lots of outdoor entertainment supplies – grills – benches – etc. 1-Lot of Antique Branding Irons Lots of Bedding, Linens, Towels, Etc.